Untitled 1, 2017, digital photography (left), Window Pain, 2017, digital photography (middle), CMYK, 2016, digital photography (right). Image courtesy of Shea Grehan. Simply walking into Pink, White, and Blue, it is immediately apparent that this show is as sensitive and pretty as the artist who conceived it. Here, the term “pretty” is not meant to be trite, but used with intention. With pink cake, sweets galore, and delightful Valentine’s kitsch strewn about, some of our uptight expectations of an art opening slide away. Which is exactly how Lucas Stiegman looks to advocate for the rights of transgender individuals through their work. The beautiful and conventionally attractive are used as entry points in finding ease with subjects that are queer or mildly grotesque. This dichotomy forces us to recognize that these two opposites are not mutually exclusive. Just as Stiegman gets the two to balance in a thoughtful, yet fun coexistence, so too do we as viewers look to make exciting new connections and apply appropriate terminology that transcends polarized societal associations. Perfect, 2017, digital photography. Image courtesy of Shea Grehan. The first encounter of the show happens to the right of the door of Jan Brandt Gallery. 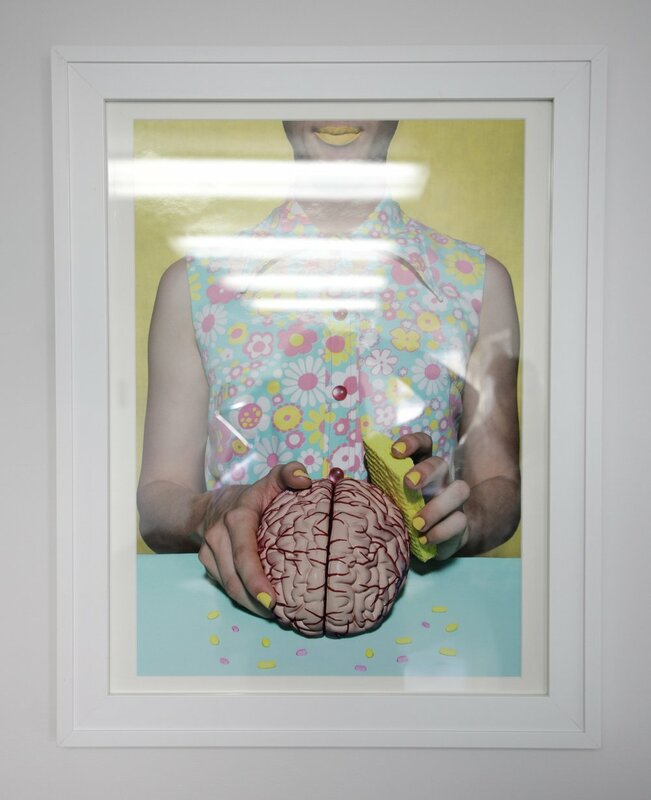 An image of the artist; a femme figure dressed in a retro 50’s housedress, scrubbing a ceramic brain, surrounded by a confetti of pills, with a sponge lightly grasped by manicured nails and complete with matching yellow lips. The funky pops of pastel make the image instantly fun and pretty, however the undertones of brainwashing, the rigidity of expectation, and ideas of suppressed anxiety become apparent after a deeper evaluation of the piece. These heavy themes do not overburden the viewer, however, and instead act as an encouragement to clear the mind and enter the show with an attitude of equity and acceptance. Americana, 2016 digital photography (top) and collaboration between Lucas Stiegman and Jan Brandt, 2017-18, mixed media/digital (bottom). Image courtesy of Lucas Stiegman. This collaboration between Lucas and Jan uses Arduino, coding, LEDs, and a distance sensor to give Jan's emroidery-hoop growths a bioluminescent quality. The creature has a glowing center that gradually pulses faster depending on the viewers distance from it. When the viewer is at a close enough range the tentacles all begin to light up in examination. Image courtesy of Lucas Stiegman. Another key piece of the show is entitled Americana, in which the artist sits on a patch of their family farm, surrounded by an array of pink and blue objects dripping in symbolism. A small vase of pink flowers to the far left bloom within a hanging blue cage, while a larger pot of pink flowers flourishes opposite on the right. A blue lamp sits on the table, unable to light up because of its unconventional outdoor setting. A pink flamingo sits confidently next to the artist, like a faithful canine waiting for a cue. All of this orbits the main femme figure, dressed in pink, applying coordinating lipstick with the help of a compact mirror. Their figure sits in an iconic pose of a born cover girl, yet we as viewers know such a role doesn’t quite suit the character, and we are left at a tantalizing loss to place the scene into our internal codex of known scenarios. Dream House, 2017, digital photography (left) and Untitled 2, 2016, digital photography (right). Image courtesy of Shea Grehan. More photographs are posted about the gallery space, with paper hearts interspersed. Two of which, featuring doll house miniatures, are sweetly placed on the side of the gallery refrigerator, in a moment that can harken back to the innocence of any childhood. Lighting up the space is an experimental collaborative piece between the gallery owner, Jan Brandt, and Steigman. The motion activated glow of the amorphous, pink and multicolored, multi-textured creature underscores the participatory nature of the themes Lucas talks about in their statement, as well as the larger human theme of empathy present in the show. Stiegman is certainly sitting pretty after Pink, White, and Blue–a featured interview entitled “Finding Comfort Within the Discomfort” published in the Pantagraph, sees Steigman’s role as an articulate advocate for the transgender community continue to flourish.